I try to focus on the work at hand as we prepare the old house for sale. Even though lots of memories are evoked as we go, and Steven tackles the difficult challenges of finishing Keith’s unfinished house projects, going through collections of “stuff” inside the house, the workshop, the basement, and all around outside, I feel incredibly blessed. Although it’s taken longer, Steve’s workmanship shows and I know it’s a matter of pride – and love – in his mind, and I am forever grateful to this wonderful man who has taken on so much. To live in the shadow of Keith’s spirit can be a challenge. But today I think I found a sign that Keith was pleased. Dane and I moved a very large 10-drawer flat file into the garage today. Drawer by drawer. Most were empty already but several were full and it was kind of a pain. But we got all the drawers moved and prepared to move the cabinet that held them. I looked back to the empty steel cabinet and there was some stuff still there, curled up against the back. A few pieces of Stassia’s, a few pieces of mine. But there was this one big piece still curled up against the back wall. I pulled it out and there it was – an impromptu angel made from overspray from a project Keith did many years ago. And in the corner, he’d painted his initials “KF” to ensure there was no doubt. Among the last pieces of family “art” to get moved out of the house. Finding it today felt like a special sign, a message of love from the spirit of Keith. Spraypaint art made by Keith when he was working with Stassia on a costume. He liked the angel he recognized and signed it in the corner. I’d completely forgotten about this until my daughter reminded me. Traveling has a way of creating magic and expanding our vision here and beyond. On a steamy hot July 4th, we floated in the waters of Sacandaga Lake in the Adirondack Mountains of upstate New York. Disembodied heads peeked above the waters – me, Steve, Larry, Jean, John, Patty, Brian plus other old friends. As the waters sparkled in the sunlight, my vision shifted, seeing tendrils, threads connecting each of us, our heads, 7th chakras, energy paths from one to another, and then above. It was surreal and yet very real… I shook my head several times to try and dispel the vision, yet it persisted. The vision began to fade so I sketched it quickly in order to bring it back to further enhance in art. My quick sketch of the vision I had looking at my friends bobbing in the waters of Sacandaga Lake, Adirondack Mountains, upstate New York, July 4, 2018. Conversations while in the water, heads bobbing, voices laughing, planning, life beyond work, the family by heart and blood, community of friends planning to care for each other in a life of continued adventures, but recognizing the pains of aging… Plans began for those couples without children, then those who did have children who would not be willing/able to care for aging parents… Duties were assigned: John P as our travel planner, Jean our financial/taxes person, Larry our sommelier and meal planner, me and Brian on branding development and space design, Steve our inventor and fixer-upper…should Michael join us he would be our gardener… Patty would pave the way into retirement. We could move between locations to allow time at each place and take advantage of weather… Several months in Michigan, travel to Europe, possibly a month in Fiji in April… where else? Aging into new adventures means making the most of life with family by blood and family by heart. Shifting to sooner plans, travel to Newfoundland, Canada, Kelly’s home country. When could we all visit, and how? Have passports, will travel. As we wandered the countryside, our views throughout our week were stunning… New York Adirondacks, Vermont hills, Middlebury, countryside antique shops, farmlands… peaceful, tranquil, even energizing… Saratoga, revisiting old memories. A roadside antique shop in the Adirondacks. We were watching fireworks from the baseball field across from Larry and Jean’s… the same field with the same chain link fence at home base where Keith and I hung out together with Michael, Larry, Brian and others. Standing there… Steven, Larry, Brian, Jean, me… surreal… forward, back…time seemed to cross oceans, decades, and reconnect…creating new connections. It felt powerful. Watching fireworks in the park with friends. I finally caught up with Nan O’Brien-Webb in New Haven, VT. Steve was filled with trepidation; it brought up feelings of a past bad encounter with a marriage counselor. Not what I intended at all. It was exploratory for me just to see what was up with Nan’s workshops. And it was very emotional for her, too, to meet her former best friend’s wife after finding his obituary. I no longer feel the need to have an intermediary. I see/feel connections to the spirits feeling their messages when it is important, seeing signs and recognizing them for what they are most of the time. I recognize that I have become my own intuit. Still, it was interesting to discover how others with longer experience work with this…this gift. I sent Nan a photo of Steven with the shadow of another we saw as a hint of Keith hovering over Steve after he’d gotten the great sanding machine running back in May 2013. But then, as I scrolled through the photos, I also came across another photo that I’d taken but had ignored for my aesthetic preference of another. The non-filtered photo, however, had a clear message, one that I’d completely missed before. Taken the same day as the one with the shadow of Keith… this one showed a large “K” made from the shape of the stairs leading up to the loft. … I could feel the emotion in the room, the healing that was being accomplished, even as the doors cracked open a bit to understanding of the different lives we lead in physical and spiritual form. You’ve certainly helped me to better articulate what I always felt to be true. …Funny thing… as I went to look for [the photo I promised], I discovered a second one – taken the same day – that had a message I’d completely missed. Keith oversees a sewer connection we’d been trying to get at Perry Road, only about 5-6 weeks before he passed. So I’m guessing this picture was taken around mid July 2012. Large flat-belted gears drive a giant 4-drum oscillating sander that Keith had fallen in love with in the large woodworking shop on the property at Perry Road. When he tried to get it started, the belts fell off only a few seconds after it began to run. This photo was taken in May 2013 when Steven came into my life. He too fell in love with this old machine and immediately set about to get it running, which he did! Another view of the old woodworking shop taken the same day Steven got the old sander running. I noticed the sun shining in the far windows, setting off a glowing light. But I used a different camera setting for the above photo. I almost missed the real message. This photo was take seconds before the first one just above. In looking for the picture I’d mentioned in VT, I found this one. Notice the giant “K” at the center, formed by the structure of a stairway in front of the glowing windows. SMH! I was dumbfounded when I came across this picture last night. How could I have missed it?! Finally, this is the image I mentioned to Nan. Intellectually, I know how it was made. But it gave us all goosebumps when we first saw it. I was sitting at an old handmade table saw, working on homework for my doctorate. Steve was literally scurrying around working on making the giant sander operational (it extends from where he’s climbing to the round wheels you see in front of the windows to the right behind the posts). I looked up from my studies when I heard it come to life and grabbed my phone to take this photo. The message was clear to me at that moment. Keith was VERY pleased! As I wrote to Nan, I feel that sometimes places can hold the energy of those who came before us there. Or they at least provide us a place to connect. Sometimes I feel old Maurice Reid here, as well. He was the original owner of this woodworking shop and I feel his occasional approval (or annoyance as the case may be at the time) as we try and make improvements to the old homestead. These are just some of the most profound memories I have from the week’s travels and the memories those moments inspired me to revisit. I was feeling nostalgic, and even a bit unsettled. In early 2012, just as I was preparing to go on a Fulbright scholarship trip to Russia, and was making the circuit of presentations for my doctoral work, Apple computer was making a serious update to their MobileMe platform. They were going to be shifting to iCloud and eliminating the iWeb software that had made it so easy to produce websites and blogs. In the midsts of the swirl of activities in the late Winter/early Spring, I managed to have the presence of mind to archive five years of blog posts and podcasts to a corner of my computer for future attention. Unfortunately, events in life took a serious twist. In summary: I went to Russia, returned early due to my husband’s preliminary Stage IV cancer diagnosis, he died on 9/1/12 and I found myself redefined as a young(ish) widow at the age of 51, I finished my doctorate (10/2014), remarried in to my second husband (12/2014), welcomed a new grandson (12/2015), and built a new home (2015-present). Needless to say, life has not stood still. But for some reason, a trigger happened. I felt the need to reread these old posts, pull them over my head like a warm, cozy and familiar blanket. To close my eyes and step back a bit, remind myself where I was back then. The posts generally run from early 2006 to 2011 and cover the gamut, from art exhibitions and creative musings, to reflections on travel, being present, and just some funny thoughts. Overall, I enjoyed the time spent rereading and listening to these. They simultaneously gave me a sense of wunderlust and a firm grounding, a sense of being…where I am supposed to be. 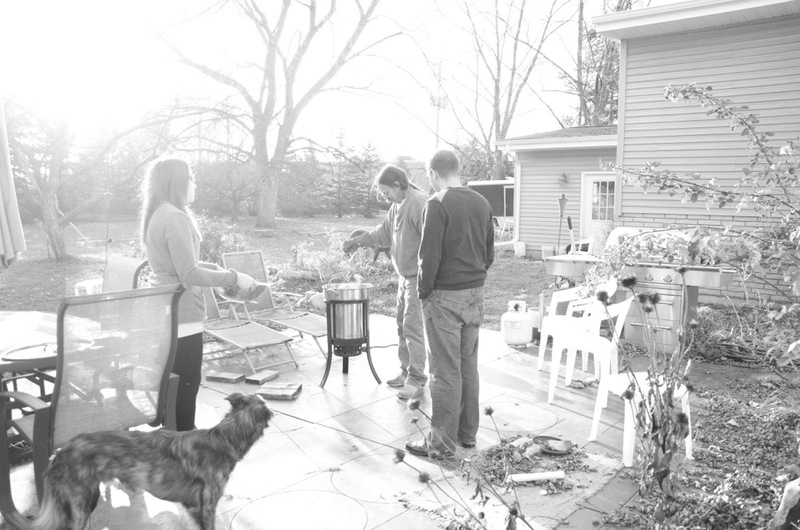 Above: Thanksgiving 2011, what was to be our last one with Keith (deep frying the turkey). We deep fried a turkey this year, our best one yet, in Keith’s honor. Missed him terribly. But celebrated our family, too. He’ll always be a part of our lives, for which I am forever grateful. During this holiday season, it is too easy to fall into despair and self-pity. Missing Keith brings me to tears, crying myself to sleep at night. But I have much to be thankful for in spite of our loss. Unfairness in life is all around us. It’s what we call it when we are frustrated, angry, despairing over what life has thrown at us. How unfair is it that Keith’s life was cut so short? How unfair is it that I would spend this holiday knowing I will never have another holiday with him, or to hear his laughter, feel his embrace? My best friend, husband, loving father… How unfair is it that I spend each night alone? Do you see how easy it is to fall into self pity? Yes, there are times when I indulge in it. There are times when I cannot fight the ache in my heart and therefore feel the overwhelming pressure of the waters that must flood their banks in the form of tears and wails. But unfairness, or to wallow in the notion of its cruel facade, is to neglect the true beauty that life has gifted me. I had 34 years with Keith, a life that had its ups and downs, yes. But it was also a time of great beauty, when we grew up, grew as humans, artists, responsible and caring people. We shared our life together and supported each other, experiencing the world, raising two beautiful, intelligent daughters. Saw each through college, and walked one down the aisle. Yes, we experienced a lifetime of love and joy and wonder together. Each day, each week, or year, we may experience what can be described as unfairness. Yes, it is painful. Yes, it is heartbreaking. And yes, there is the feeling of incredible loss and pain, seeing something or someone you care about slip beyond your reach. Feeling the sting of an unfair act, or unfair words. I could choose to measure life’s unfairness each day, tallying it up like a scorecard each week, letting it tighten its grip on my life with each passing month. But then I would be denying myself something far more important. I would be denying myself the ability to treasure the life that I have had in the past, or the one I wake to each day. If I counted up the daily unfairness tally, I might spend all my time counting. I would deny myself the joy and gratitude for the gifts I have been given. The stories of our lives that we’ve shared, and the future stories yet unwritten. Yes, there are times when life seems so unfair. But I can’t bring myself to deny the life I will build upon the foundation of a beautiful life I had with Keith. So, here’s to being thankful for my life with Keith. And to the future, watching my children build their lives, and being part of that. Here’s to whatever life will throw at me. I will not tally the unfairness of Keith’s passing. His life and our life was full and wonderful. With tinges of occasional sadness and cheeks yet slick with occasional tears, this first Thanksgiving and holiday season without him, I choose to remember him with a loving gratitude. 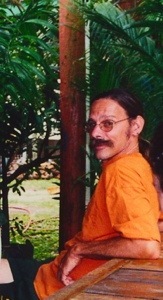 Below: This is the photo I mentioned earlier this week, taken at the Beachouse in Fiji in 2001. Love that sly grin that also said “you did it to me again, stuck me in the middle of all these Mott students.” He’d complain in a good natured “grumpy old man” sort of way. But he always had a good time anyway.